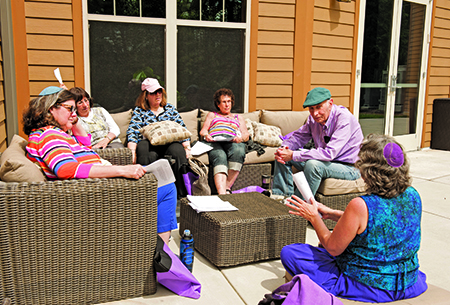 Participants in a Mussar Institute conference study Jewish ethics in a group session. Photo courtesy of The Mussar Institute. Congregation Beth Elohim, one of the largest Reform synagogues in Brooklyn, N.Y., a group of about 20 adults is seated in a circle, discussing the pros and cons of zealousness. The informal conversation ranges from taxes—“we all tend to put them off,” says one member—to Steve Jobs, who had “alacrity in creating Apple but could be too quick to speak,” notes another. The participants—including a librarian, a brand strategist, a Wall Street trader, lawyers and teachers, thirtysomethings and retirees—are learning the contemporary Jewish ethics discipline of mussar. This evening’s subject is zerizut, which means alacrity, zealousness or enthusiasm, one of the character traits that is a focus in mussar. Illustration by Helene E.R. Oppenheimer/claywisdom.com. The study process, Morinis explains, begins with knowing yourself—identifying your behaviors and the list of traits that are potential areas of growth. In general, mussar practitioners focus on a specific trait for a limited period of time, maybe a week or two. In the morning, practitioners recite a phrase, which can be from the Bible or a favorite book or show, that captures the essence of the trait. During the day, they take conscious pauses to think before responding to challenging situations. In the evening, they write about their experience in a journal. Linda Badger, 63, who was released from the prison in March 2014 after being wrongfully incarcerated for 28 years on a murder conviction, says the ethics class prepared her for the future. “It gave me a path,” she says. Badger converted to Judaism under the guidance of Rabbi Miriam Hamrell, who also taught at the institution. “When things go wrong, mussar helps you identify the possible consequences and what to do at the beginning, before you get into further problems,” says Badger, who continues to study mussar at Hamrell’s synagogue, Ahavat Torah Congregation in Los Angeles. Mussar has international appeal, with groups scattered from Israel to the Netherlands and Brazil, says Miami-based Jeffrey Agron, director of administration at The Mussar Institute. The institute has until now functioned only virtually but recently opened an office in Philadelphia. About 800 people a year sign up for online or in-person courses offered by the institute, which holds an annual conference in the United States and organized its first European meeting in 2014. The institute has trained about 100 people to be educators, is collaborating with the Union for Reform Judaism to provide training for rabbis and hopes to initiate training sessions for Conservative rabbis. A new children’s curriculum integrates a monthly Jewish value with classroom and family activities and pairs the traits of forgiveness, patience, friendship, trust, silence, responsibility, courage, generosity and kindness with Jewish holidays. There are also online mussar Torah commentary courses offered by the Institute of Jewish Spirituality. “Not much in Judaism addresses the reality that each of us is a unique individual,” says Morinis, who was born and raised in a culturally Jewish but nonobservant home in Toronto. A Rhodes scholar in anthropology at the University of Oxford in England, he was a university professor before he switched careers and became CEO of a successful film production company. His company collapsed in 1997 and, during the ensuing professional and personal crisis, he says, he felt a “calling in his soul” to search out the “real depths of life.” He happened upon mussar, which draws on Jewish teachings developed over thousands of years and grew into a movement led by Lithuanian Rabbi Israel Salanter and his disciples beginning in the 19th century. The Holocaust destroyed many of mussar’s established scholars, but in Far Rockaway, N.Y., Morinis found an Orthodox rabbi, Yechiel Perr, who had married into a family of mussar masters and had learned the tradition from his wife’s father and grandfather. In the past, mussar took on a finger-wagging approach in the Orthodox yeshiva world, explains Rabbi Avi Fertig, associate dean of The Mussar Institute, who is a yeshiva graduate. “Historically, mussar began with a focus on fear of heaven and the repercussions of sin. With this backdrop, the term took on the connotation of rebuke,” explains Fertig, who currently lives in Israel and teaches at Yeshivat Reishit in Beit Shemesh. Today, mentors encourage students to focus on the positive, both in terms of inner joy and improved relationships, but some of the original connotations persist. Most yeshivot have a mussar curriculum, including a sermon once or twice a week and an optional half-hour daily study period. The intensity of mussar has largely been lost, Fertig says, but several contemporary rabbis are propagating it within the Orthodox world, particularly in Israel. Mussar’s distinctiveness is that it helps inform contemporary Jews that they don’t have to abandon Judaism to find a spiritual tradition, says Philadelphia-based Conservative Rabbi Ira Stone, 67, another leading proponent and teacher of mussar. “If you’re struggling with what it means to be Jewish, mussar is a powerful prescription,” says Stone, who stumbled onto it through a pamphlet for a mussar anthology while he was in rabbinical school in 1972. Rahel Musleah, a regular contributor to Hadassah Magazine, also runs Jewish tours to India (explorejewishindia.com). Rahel – thank you so much for spreading the word about Mussar. It has been an absolutely life changing practice for me. I better understand those things that were holding me back from being my best self. And I have come to understand that we all have what it takes to be a Mensch – all we need is a guidebook, and Mussar is that guide. Thank you Rahel for this interesting overview! I am a fan of Edith Brotman’s approach and have practiced the midot in her book for more than two years now with my Yoga teacher. In Amsterdam, in the Netherlands, we are organizing a European meeting again on june 22 – 24: The Mussar Summer Academy 2017. Moshe Chaim Luzzatto, author of Mesillat Yesharim (Path of the Just) lived in Amsterdam between 1735 and 1743. We’ve invited speakers from all over the world to reflect on Luzzatto’s contribution to Mussar. I really enjoyed the article about Mussar, Ms. Musleah. 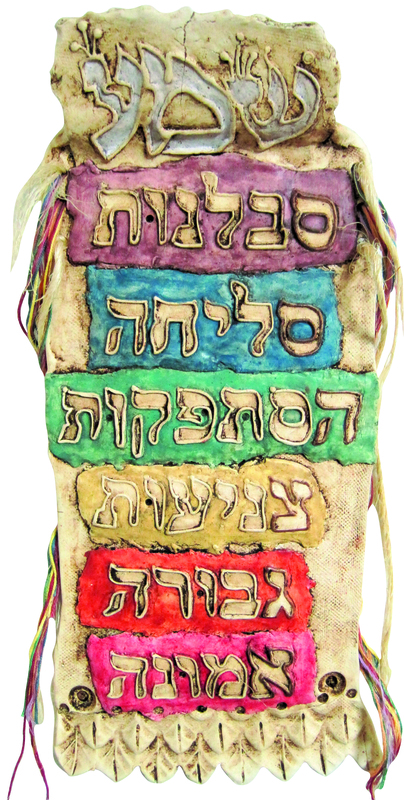 I also really like the beautiful Hebrew art piece that’s part of the article that shows some of the character traits. It looks like the word on top of the art is Shama, which is great because paying attention to the character traits is the whole idea about Mussar. I also like the different colors used for each character trait. I think the colors help to emphasize each trait and yet they can all work together. Helene Oppenheimer’s Clay sculpture is exquisite. It pierces the mind and touches the heart. It educates and elevates. It explains more than words. A magnificent contribution. A visual delight. Thank you for this fantastic article about Mussar. I have been studying and practicing Mussar for over 4 years at Temple Adat Elohim in Thousand Oaks, California and it has totally changed my life. The artwork by Helene Oppenheimer is beautiful and she is a very talented artist and I am very happy to say that I own several of her exceptional pieces of art. Thank you for your comments! I’m glad the article has been helpful to illuminate the practice of mussar.